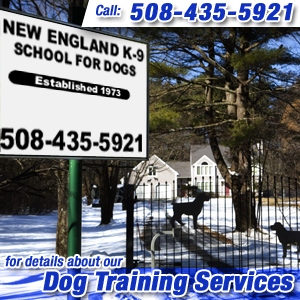 New England K-9 School For Dogs located in Hopkinton, MA serves customers in the entire New England area. From puppies to problems to protection..."For quality without compromise since 1973." 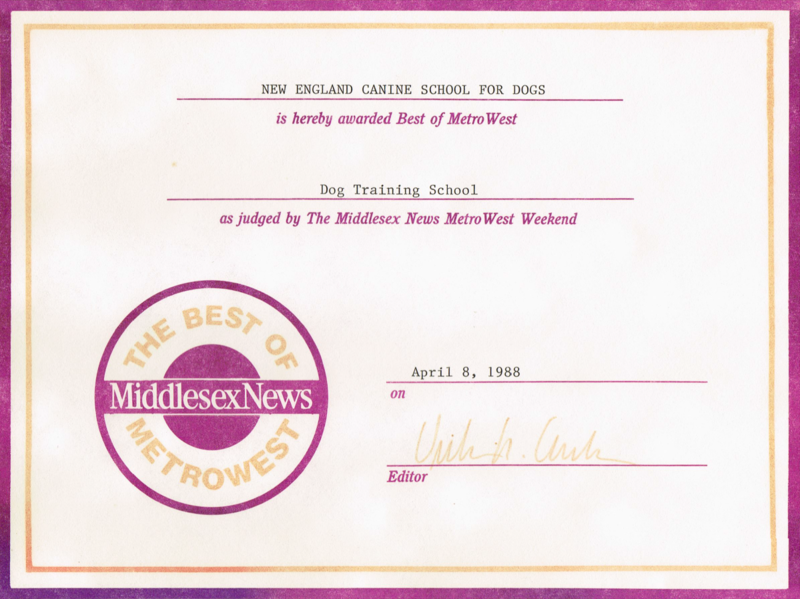 Awarded "Best of Metro West". Private lessons in your home or at the school by appointment. We offer all phases of family pet obedience training. These services include basic obedience lessons, house breaking, problem dog issues, and puppy consultations through private personalized programs. We also offer specialized services which include: Schutzhund, AKC obedience competition, personal protection, tracking and guard dog training. We are proud to have the following affiliations-US Professional Dog Trainers Association (USPDTA) and Technical Advisory Service for Attorneys (TASA). We tell all our clients that this is not dog training. It is 100% people training. The dog is only as good as you are. Up until now the dog has trained you, from now on you train the dog. Up until now you thought that you were the boss. The dog knows that he is the boss. These are the things we have to change. It is all done with a lot of love and praise and a leash and a collar. Specialty Dog Training - In-depth specialty and professional training of dogs, including development of skills used for personal protection, guard dog, Schutzhund, field trial, search and rescue, and more. Be sure look at our testimonial page to see what others have to say about us! We are Located in Metrowest Massachusetts and provide dog training services to Worcester, Framingham, Milford, Franklin, Bellingham, Needham, Dedham, Norwood, Newton, Waltham, Cambridge, Belmont, Brookline, Arlington, Walpole, Foxborough, Marlborough, Northborough, Wellesley, Dover, Sherborn, Natick, Concord, Acton, Hudson, Maynard and surrounding areas. Click here for a full list. Contact New England K-9 School For Dogs today at 508-435-5921 to schedule an appointment for your dog.